It was notable that the Post endorsed Adrian Fenty two weeks ago because of the date. This morning’s endorsement of former councilman Vincent Orange is remarkable because it seems their only significant issue is Kwame Brown’s personal debt. The Post praises Orange’s leadership and conviction, and his vote of “Present” on the selection of Attorney General Peter J. Nickles, but the editorial is entirely silent on the matters of policy facing the council now, or on the policy debates between Brown & Orange. I have to say: the endorsements from the Post have not happened as I would have expected, and that perhaps their editorial board might be a bit divorced from day to day life in the District these days. I was thinking, that given the candidates in both the Mayor’s race and the Council Chair’s race, we would likely be facing a no-endorse statement, but it seems that the Post has weighed in early and peculiarly. What do you make of these endorsements? The Post is completely out of touch. I actually am offended by their blind allegiance to Adrian Fenty. They have been biased in their coverage in the Mayor’s Race from the start. Does the editorial board live in DC? Or do they just watch what happens from afar and throw stones instead of meaninginful and thought provoking news coverage. On the Chairman’s race – it seems like the Post wanted it to be more of a race from the start. Maybe to distract from what they were not writing about Adrian. Fenty doesn’t consult with the community on ANYTHING. Fenty has not held ONE news conference since becoming Mayor. Not one. Fenty led a sketchy donation of firetrucks to the Dominican Republic. Don’t we need them? Fenty has a poor record on juvenile justice and public safety- Kids that were in custody murdered DC Principal Brian Betts. You say in regards to Orange “…and his vote of “Present” on the selection of Attorney General Peter J. Nickles.” Note that it was Kwame that made the vote ‘Present’ on Nickles (versus yay/nay). Mayor Fenty has done an excellent job turning around a dysfunctional government into a government the runs extremely well and works. The results speak for themselves and people need to get pass this glad handling type of Mayor, Mayor Barry is done and those days are done. Education is up, the schools are safe(no more shootings in the schools), crime is down, MVA works better, affordable housing is more available, AIDS treatment and awareness is much better. We do not need a Mayor that shows up at every event, we need a Mayor the addresses and fixes the events that occur throughout the city. The Post did an excellent job endorsing the Mayor and he deserves 4 more years. The Pettiness as I see it is from the voters. The voters are being petty and silly! This is why we can never get real home rule and independence! Go Mayor Fenty- 4 more years! Let’s be real. you cannot expect to run an $11B city when you are in nearly $1M of personal debt. The washington post had it right on their endorsement of Vincent Orange for Council Chair. Talk about frat brothers, Kwame Brown and Adrian Fenty are Frat brothers, they come from the same breed, and i am offended that any of you would ignore a persons qualifications and focus solely on likability. Thats what got us into the mess we’re in now. Vincent Orange holds Five different degrees, not to mention course completions at Harvard. Vincent Orange took small, local and disadvantaged business spend to an all time high in the District. Vincent Orange, was a bulldog over city funds, so much that he called then-Mayor Williams before the Committee on Gov Ops to question him about misspending. Vincent Orange got DC’s economic resurrgence underway by bringing the FIRST economic development project to DC IN 20 YEARS, that created jobs for ppl in the Ward he represented and has brought in millions of dollars in revenue for this City. If you didnt know, the more revenue that comes into this city, the less taxes you have to pay. Vincent Orange fought and scrapped to find the funds for renovation and reopen McKinley Technology Senior High School, a school that is viewed as one of our city better performing. Vincent Orange worked to secure the initial funds for Phelps which Brown talks about everywhere he goes. 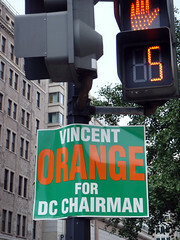 Vincent Orange created the living wage act and increased the living wage in the District to 11.75/hr, a law that Brown, who oversees economic development in DC has yet to enforce. Brown talks about hiring DC residents, Vincent Orange created his own Summer Jobs program for Ward 5 youth, in addition to writing legislation to fund 10,000 summer youth employment jobs. Let’s Be Real>>> You should be afraid if Kwame Brown got the Post endorsement. You should be afraid that his name is even on the ballot for Council Chair. I dont play with my money, but obviously, in these trying economic times you all are ready to throw yours down the drain. I’ve got enough experience in this town to recognize that a degree means you exchanged money for a sheet of paper and maybe, just maybe, some knowledge. Know that Kwame Brown doesnt have the experience or knowledge to led the Council and steer us out of the financial mess that this city is heading towards. Maybe your experience can help you understand that likability doesnt produce tangible results, it wont put money into our city’s reserve, it wont educate our children and it definitely wont help put residents back to work. A capabable and competent professional, who offers unqiue skills and know-how gained from experience, training and academia is what Vincent Orange presents to the electorate. And what does Kwame Brown present?